For confirming the identity of unknown gemstones, brought to you by Mineralab. The Gem-n-Eye III is fitted with an eye-catching, easy-to-read OLED display, and was internally upgraded with advanced processing capability for greater precision in measurements. It still is built around a 21st Century grade Light Sensor offering greater accuracy and repeatability on top of a precision calibration scheme. Unlike a traditional critical angle refractometer, the Gem-n-Eye requires no toxic fluid, and gives a digital readout in the form of a Refractive Index to 3 decimal places, along with the Gemstone names that share that RI value! The Gem-n-Eye does this by measuring Reflectivity, a property closely related to Refractive Index, and through a sophisticated algorithm, converts that to a familiar Refractive Index value, and then conducts a lookup within its internal database to find and display the matching gem (s) - no need to convert values or cross reference to separate charts, or plug into a computer, because the Gem-n-Eye already is a computer. How do I use the Gem-n-Eye? What is the range of the Gem-n-Eye? Unlike a traditional refractometer, there is no limitation above the RI level of 1.81. Therefore, the Gem-n-Eye measures the full range of RI values, between 1.300 and 3.300, from low ranging Fluorite and Glass, then through the primary Colored Stone range, all the way up to and beyond high-index Diamond, including its many simulants such as CZ, Moissanite, etc. Likewise, the Gem-n-Eye can also measure certain garnets including Demantoid and high Spessartines and Almandines, along with Zircon, that are beyond the reach of traditional refractometers. Which of these can I measure, among Faceted stones, Cabochons, Mounted stones, and Gem Rough? Generally, the stones need to be Faceted. More specifically, the stone must have a flat, smooth, polished surface, and lay flat on top of the optical eye of the sensor. Therefore, loose faceted stones can definitely be measured, and many faceted stones that are mounted in settings can also be measured, even some larger ones where the setting itself protrudes beyond the table facet of the gem. Interestingly, some loose Cabochons will give good readings as well, but only from the back side, and only if the back has been well polished and to a flat shape - otherwise cabochon testing is not reliable. Gem rough generally is not measurable, however, certain species of gem minerals, in crystal form, can be measured if a surface of the crystal is naturally flat and highly polished, without striations or other surface imperfections. As to minimum size, the diameter of the light sensor hole is 1/32", so any stone tested must have a table facet of at least that 1/32" across. What stones will the Gem-n-Eye distinguish between? How accurate is the Gem-n-Eye? It is still not as precise or consistent as a traditional critical angle refractometer, and it does not measure birefringence. Because the Gem-n-Eye uses reflectivity to indirectly impute Refractive Index, any variability in the surface of a gem can result in some variance in your readings. On the whole, your gemstone measurements should be within about +/- .010 of an RI value. It should be mentioned, however, that the Gem-n-Eye is much more accurate and precise than similar instruments such as the Jeweler's Eye, Presidium Reflectivity Meter, and Refractive Index Meter. 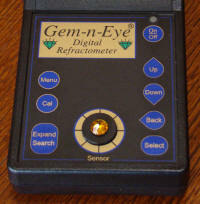 And unlike similar devices such as the Jemeter 90 or the Gemmeter, the Gem-n-Eye properly accounts for Dispersion associated with many high index stones. For example, while Strontium Titanate and Diamond share the same RI value of about 2.41, the Gem-n-Eye nevertheless easily distinguishes between the two stones. The Gem-n-Eye is designed to be calibration free, that is, the factory calibration, combined with a sophisticated temperature adjustment feature, keeps readings consistent. For users who want to fine tune measurements, the Gem-n-Eye incorporates effortless, push-button calibration adjustment. Can the Gem-n-Eye distinguish between Natural vs. Synthetic gems of the same species? No, but the same can be said for most gem ID tools. As an example, a lab grown Ruby has the same Refractive Index and Reflective properties as a Ruby mined from the earth, so the Gem-n-Eye will still confirm the identity of a Synthetic Ruby as a Ruby. However, the Gem-n-Eye can certainly make distinctions between valuable gems and their cheap imitations and simulants that are of a different species. This is the first order of business in Gem ID. How large is the Gem-n-Eye database? The Gem-n-Eye incorporates an internal retrievable database of over 200 gems, with complete property data on each gem. However, by default, the instrument works with just the 25 most Common gems that most of us are likely to have or acquire. But the simple push of a button expands that list to include Less Common gems, and with another button push, adds Rare gems to the mix, and with a final button push, includes Collector gems as well. So from the amateur to the professional gem collector, the Gem-n-Eye is easily customizable to your needs. What else does the Gem-n-Eye do? Since it has a built-in database, the Gem-n-Eye can also serve as your main Gemstone Reference source. For instance, suppose you discover a gemstone with an unusual name like Shanseres. Just scroll through the alphabetically ordered database of Primary and Related Names to learn that Shanseres is a variety of Diopside. Or do a Quick Search for all Pink colored stones, and so on. In this capacity, the Gem-n-Eye shows its intelligence. For example, you can specify a percentage allowance of your measurements of the quantitative properties like Specific Gravity. Also, you can choose up to two colors to match because if you're like some of us, you can't tell if a certain stone is green or blue. These "smart search" features will prevent you from inadvertently eliminating a qualified gemstone species from consideration in your effort to identify it. How portable is the Gem-n-Eye? The Gem-n-Eye can be used at your desk, but it is also small and compact enough to take on a buying trip to a gem show, a flea market, or foreign country. Dimensions are 7.5" long x 4.1" wide by 2.3" tall. It runs on either a single 9V battery or a 115V A/C adapter, both of which are included. A padded carrying case with belt loop is also provided. What all comes with the instrument? Please read the Buyer's Guide, and review the comparative table farther below. How do I purchase the Gem-n-Eye? Just Add to Shopping Cart. This product typically ships within 1 business day. Buyer's Guide: The Gem-n-Eye III should be considered by those who have difficulty reading a traditional Critical Angle Refractometer, and/or want to avoid the latter instrument's somewhat toxic fluid, and for those who work with high index stones, including some Garnets, Zircon, and Diamond, etc. But while the Critical Angle Refractometer is a "determinative" tool because of its high level of accuracy and consistency, and that it also measures Birefringence, the Gem-n-Eye III should be considered more of a "confirmative" tool. The following tables compare the pros and cons of the two types of instruments. I like the main menu, it is very easy to use. I find the database very convenient.